Why was there no “Day Five” blog? Sheer exhaustion, but in a good way. Let me see if I can remember everything that happened. 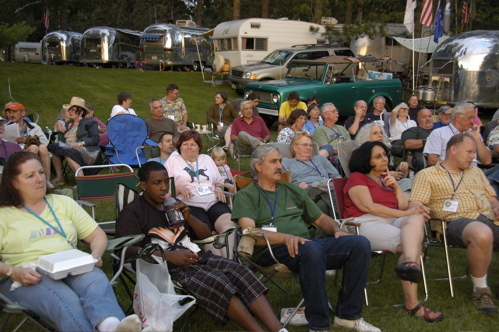 We peaked at 89 trailers on Saturday night, which filled most of the space available to us this year. We were blown away It was really awesome in our vintage village, with everyone having fun, exchanging ideas, attending seminars, taking pictures, and exploring the park. At 10 a.m. 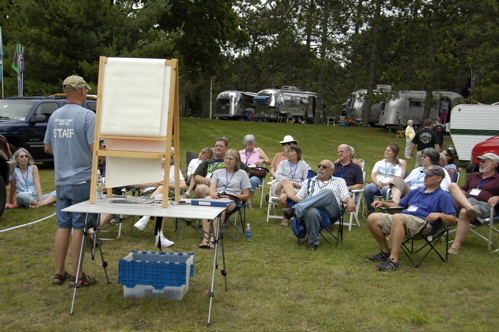 I led a seminar on writing and photography for publication, which led to discovery of several budding writers and one illustrator. At 1 p.m. I was back up again with a seminar on full-timing and working on the road, which was packed with people and really interesting because of all the feedback I got from people who were either full-timers, part-timers, or wannabees. While I was finishing the talk, Emma, Eleanor and my parents arrived, which lent a little credibility to my story about being on the road for three years. People wanted to ask Emma questions as soon as she arrived. I probably could have turned the seminar over to her. Then Colin stepped in with a sobering (but informative!) talk on the real costs of restoration, and what drives those costs. Steve and Colin wrapped it up with a joint seminar on “sourcing parts” and then it was 4 p.m. and we were all wondering where the day went. At Happy Hour we went nuts giving away prizes. 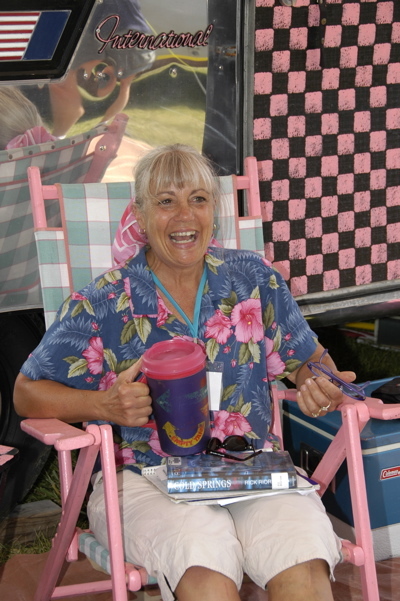 We gave away another six books, a pair of Vroomer’s “Airstream” slippers, a “campfire in a can,” a set of aluminum tumblers, and a Cyclo polisher worth $260. We awarded prizes for People’s Choice trailer, Best of Show, and Rat Trailer, all of which came with prizes. But it was a bittersweet evening, because we knew the event was coming to a close. Already people with work on Monday were slipping away, and by nightfall we had 55 trailers left. And then the rain came. We’ve been lucky with the weather so far but our luck ran out. It poured, for hours. 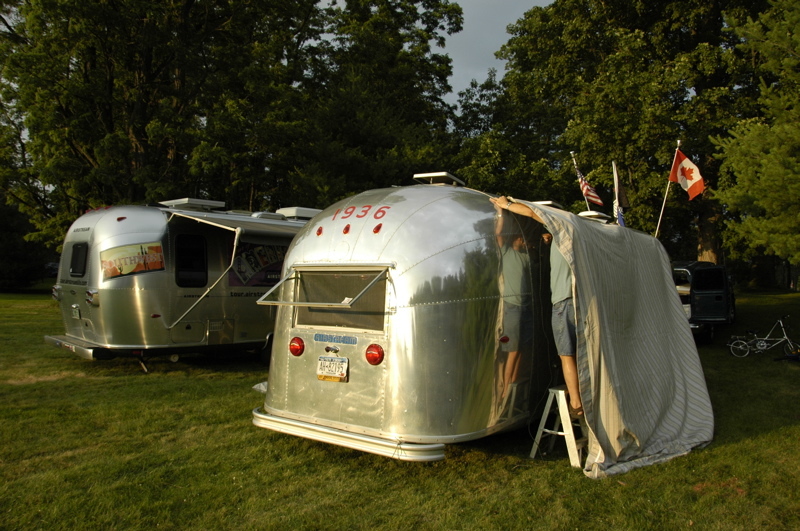 The evening chat with Fred Coldwell had to be canceled, and everyone retreated to their trailers to spend a quiet night. Many of us (myself included) were grateful for the break, because it gave us a nice wind-down from days of relentless scurrying around the lawn. The rain revealed that our trailer has sprung a leak in the roof somewhere. Water dripped incessantly in a side bedroom window, and we had to collect it in a stack of towels. I’ll be stopping at Colin’s shop tomorrow to get the leak test process done, and I’ll report on that. We had it done a year ago, and sealed up several potential leaks, but with a lot of road miles on the trailer, it really needs to be done annually. The question on everyone’s mind seems to be whether we will do it again. I expect we will. The VTJ was a huge success from every angle, and in spite of the workload I loved doing it. We have learned a lot which will make next year’s event better (and easier! ), and I am certain that next year we can increase our numbers quite a bit. We’ve also had many offers to help from people who attended this year, and that is really motivating us to do it again too. Now, Monday afternoon, it’s all over. I couldn’t bring out my camera to take photos of people leaving because it was so sad to see. By 1 p.m. there were a dozen of us left, and now at 6 p.m. there is only my trailer and Colin’s still on the lawn, where we recently had a festival and a temporary city. The electrical cables and water hoses are rolled up, our stakes are pulled, and recycling is neatly packed in two barrels. We’ve taken pains to leave no trace of our presence here. In fact, the lawn is cleaner than when we arrived, because we’d like to come back. The Saratoga Spa State Park is a superb venue, and right now the VTJ is the only way to camp in it. Brett and I will spend one more night here and pull out in the morning to drop him at the airport. And then it will be time to do something else. For unknown reasons we were all up even earlier today, at about 5:45 a.m. We didn’t have the excuse of an early parker arriving at dawn, so I can’t fathom why I felt unable to sleep to a civilized hour. When I woke up, Fred was already awake and lying quietly on the dinette, probably contemplating what he could do in a strange trailer without disturbing me. Back in the rear bedroom, Brett was rolling around in reluctant preparation to get up too. Since Fred joined us yesterday from Colorado, we are three guys in one big trailer. With door prizes, spare registration materials, computers, cameras, and cables, there is hardly room for Fred’s luggage or our dinner. The easiest thing to do is to stay out of the trailer most of the time, and use it primarily for sleeping the few hours we allot ourselves each night. With the VTJ rolling along tumultuously, we have had precious few moments to sit in the trailer anyway. This morning over breakfast Fred commented that he could easily get along for three days on adrenaline alone, but for Brett and I, this is already Day Four. The Jam has been enormous fun and keeping us propped up so far. Today’s major event was the Open House from 10 a.m. to 2 p.m., which kept everyone busy. I don’t know how many people walked through but there were certainly dozens of visitors from town, in addition to about 200 people camped here. I led a photography safari through the maze of trailers with a few people tagging along. 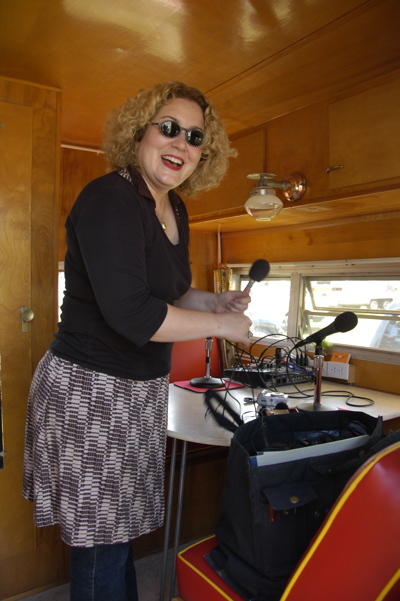 Sabrina Artel recorded her radio show, “Trailer Talk” on site, and then in the afternoon the seminars began with Susanne Brown talking about interior design of trailers. Even with temperatures in the upper 80s and plenty of humidity (back again), everyone seemed to be having a terrific time. After Susanne, we had Colin Iwasa from Yamaha talking about generators, and then it was time for happy hour, where we gave away six t-shirts, three bottles of Corrosion-X, three bottles of Rejex, two Maxxair vent covers, two copies of the book “Airstream Living,” one copy of the book “Silver Palaces,” and a second 12-volt “Endless Breeze” fan from Fantastic Vent. Then we fired up the band for a 40-minute set, and got everyone started on their catered dinner on the lawn while the band played a second set. Now it’s time for the evening movie at 8:30, outside on the lawn amidst the trailers, while I fine-tune my presentations for tomorrow back here in the Airstream. The local newspapers have been in love with the VTJ. We got front-page coverage from the Saratoga Post-Star and the Daily Gazette today. Tomorrow I’m expecting a reporter from a third newspaper. The park seems happy with us, and everyone here is calling for another Jam next year. I don’t really know if we can do it, but we will be checking into the prospects. It would be a great thing if we can pull it off again, but I’d rather think about that in a week or so, after I’ve caught up on sleep. Once I have a good high-speed Internet connection, I’ll make a new Flickr album with all my VTJ photos and notify you here. The VTJ is a huge success. Everyone seems to be loving it, even as they are crammed into an increasingly crowded space. I think that’s because the space is crowded with cool vintage rigs of all types, and their fun owners. This morning started at 6:15 for Brett and I, as someone arrived for extremely early parking. 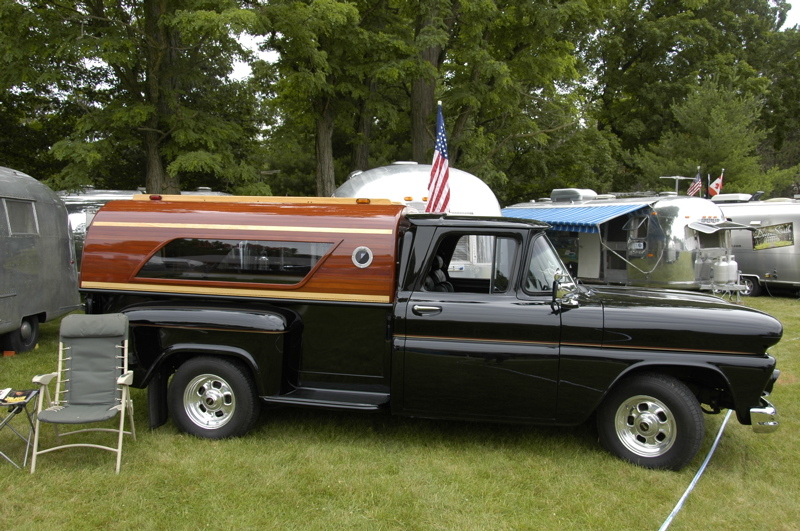 The thrumming of his vintage truck woke us up, so I dashed out to get him parked quickly in the hope of not waking up any more people than necessary. From there it was all go-go-go. At 7:30 we met up with park personnel to get some low branches trimmed, and Abe was busy managing that process all morning. Registration was set up at 7:30 with Steve, Kim, Melissa, and Star handling everything. Don, Brett and probably some other people were running around parking people. Electric lines were being strung by a team of seven other volunteers by 9 a.m., and the first newspaper reporters arrived at 9 also. We’ve got excellent coverage coming. All the area newspapers are running stories and/or photos on Saturday. 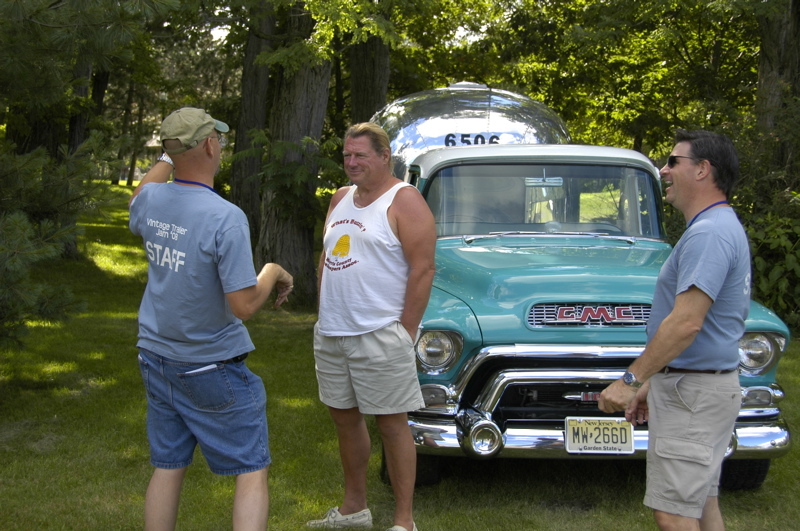 Two TV stations are expected tomorrow, and the Automobile Museum’s director of programs (Alan Edstrom) was interviewed on NPR this morning. It seems our little event is catching the eye of a lot of people. Tomorrow’s Open House should be a very exciting time. From 6 to about 7:30 we organizers (Brett, myself, Colin, and Steve) ran around solving problems and parking late arrivals. A few people arrived who had never towed before and were afraid to back up, so I backed up one myself and helped some others. A couple of water hoses broke and had to be replaced, some electrical GFIs tripped repeatedly and we had to isolate some trailers that were problematic, and in the midst of it all we tried to figure out if we still had space to park the 10 more trailers we expect to see on Saturday (we do). Somewhere in there we managed to scarf down dinner, and then at 7:30 we set up Fred Coldwell for his outdoor presentation on “Airstreams from 1939 to 1959″, with a projector, sound system, screen, computer, and our trusty utility Yamaha 1000 to power it all. Our participants have seen very little of this. They seem to be generally having a wonderful time, which is of course what we want. People keep complimenting us on how well organized we are, and what a great place we’ve picked. Honestly, all the advance work we did would be for nothing if we hadn’t had about ten volunteers also pitching in to make things happen. At this point it is 9:30 and I’m looking forward to bed. There’s a lot of action still going on outside and I hate to miss it. But it looks like tomorrow will start early for us too, and we’ve got to get some rest if we are going to survive the rest of this weekend. When I was preparing for this event, Eleanor asked me if I was worried about it. I told her I was worried only about two things: eating and sleeping. Those are the two things that are hardest to do at an event like this, because the action never stops from dawn to dusk, and Brett and I are always running around taking care of things. That’s how it has gone on Day One. We were up and dressed by 6:30 this morning, and feeling more comfortable since a weather front came through with crisp cool air. At 8 a.m. we were parking Hunt Jones’ shiny Globe Trotter (he spent the night at the “Bullpen,” our holding area for nighttime arrivals) and at 9 a.m. our first guests showed up. We spent the day dealing with all the little issues that pop up when you are tucking trailers into spots all around the pine trees. Low branches were an early problem but the park staff were very responsive and had the branches trimmed off within an hour. But the jobs began to multiply quickly and so we began recruiting our volunteers for help as they arrived. Adam and Susan showed up and helped Brett and I stuff 100 “goody bags” with literature and gifts for everyone. The young boys were conscripted as runners, to deliver packages and news around the campground. By noon we had probably a dozen trailers, and a neat little “credentials station” set up under a tent by the road, complete with a staff of 3-5 people, a laptop computer, laser printer, and a little Yamaha generator powering it all. 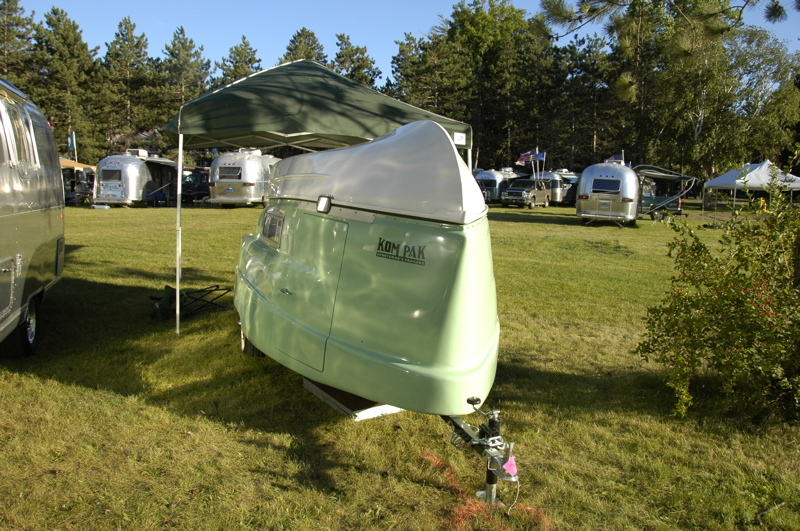 As each trailer pulled up, we greeted it with a cheery smile and easy directions to get parked, because we wanted to make the experience of arriving as easy and simple as possible. It seemed to work, because everyone looked thrilled to be here and happy to get set up. At 3 p.m. I broke out for an orientation meeting with all present volunteers and while were were in the Automobile Museum another half dozen trailers showed up. By this point the field was starting to really look great, filling in with a lot of cool trailers. By 5 p.m. we closed the credential station but trailers kept arriving, so we kept jumping up from whatever we were doing (happy hour, dinner, troubleshooting, photography) to park more people. All told, we’ve got 36 trailers set up today and should get another 50 or so tomorrow. I can’t say enough about the fun people we’ve got here. Everyone is out and about, talking, laughing, telling stories and sharing knowledge. Already the event is a success, and it hasn’t even officially started yet. I’m a little sunburnt and hoarse in the throat, but the friends we have here and the things that are happening are making me (and the other guys who helped organize this) feel good. Looks like a few great days are ahead. 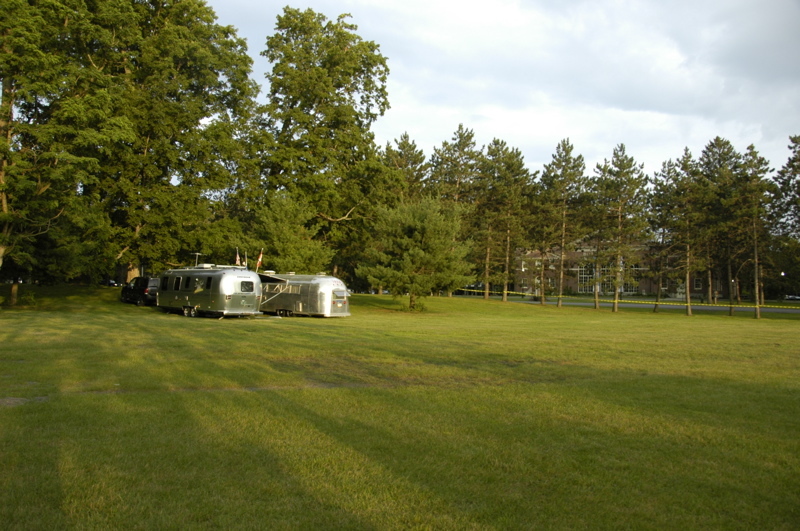 We’ve arrived at Saratoga Spa State Park, site of the Vintage Trailer Jam this week. As always seems to happen when I’ve got a major event to attend, we had a glitch before departing. The trailer was hitched up and ready to roll at 8:15 this morning, but the Prodigy brake controller reported “N.C.” which means “no connection” to the trailer brakes. We tried the obvious things, and determined that the trailer brakes were working fine, and the problem was in the truck. Since we just came out of the Nissan dealership the day before, and they were working on the trailer wiring, we assumed they’d mixed up something. So we unhitched and drove up to the dealership again, where they tested everything and could find no problem. After an hour of that we gave up on the dealer and drove over to the local RV shop, where they understand brake controllers. Pete’s RV hooked up a testing unit and saw the problem, and in less than 10 minutes had it diagnosed as a bad 7-way plug on the truck. The factory-installed plug has seen three years of heavy use, and has been connected and disconnected hundreds of times. Something inside a sealed module seemed to have worn out, and it wasn’t serviceable. The tech at Pete’s popped in a new plug and we were good to go again. Minimum service charge plus parts: $65. By 11 a.m. we were on the road with the Airstream right behind us. After the refrigerator failure, the turn/brake indicator failure, and the 7-way plug failure, I was starting to wonder if we’d make it to Saratoga at all, but we did, even through heavy rainshowers along I-87. By the way, the front compartment repair done in May by Colonial Airstream’s service department has been proven successful. After towing in heavy rain the compartment was snug and dry. Today is probably going to be the worst weather day of the week. The humidity flirted with 100% (meaning a hot fog formed in some spots nearby) and with partial sun beating down on us while we walked the grounds to mark parking spots. Tomorrow a cold front is supposed to come through and bring us sunny and much drier air, which will be extremely welcome. In addition to Brett and myself, Colin Hyde, Hunt Jones, and Don Collimore were here to get the pre-event jobs done. We all sweated and guzzled water and wandered around the field trying to figure out how exactly 83 trailers are going to manage to get parked on level ground, reach the power lines, and depart later without crunching into each other or falling in one of the many massive gopher holes that dot the field. Colin had made a plan months ago but there were significant logistical barriers he had not accounted for (a couple of large muddy spots, low overhanging branches, etc). It was not the finest hour of any of our lives but we did manage to get it all worked out. I hope. We’ll find out tomorrow when 38 trailers are expected to arrive. Those are our “early birds,” many of whom are also volunteering to help with the rest of the Jam. With their help we might even survive this thing. 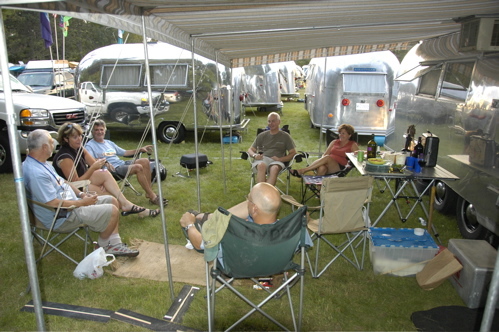 It’s a good thing that many of them are friends from previous Airstream rallies. They’re more forgiving. This evening after we’d done what we could to get ready, we pulled my Airstream and Colin’s over to the official site and parked ourselves in two of the most difficult spots. We’ll be the last ones out, so it makes sense for us to take the most “buried” spots. Once the other trailers arrive we won’t be able to leave. We even set up awnings and broke out a generator for some air conditioning. 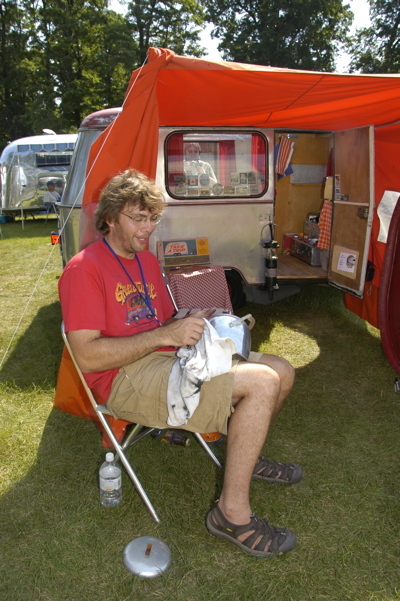 That’s Colin wrestling with his vintage awning at right. The last minor issue of the day was the arrival of the NY State Park Police, who apparently didn’t get the memo that we were going to be camped here. Fortunately the officer was willing to listen to Colin’s explanation and didn’t pursue it any further than asking some questions. We are still here and nobody is trying to move us out. That’s good because tomorrow this empty field is going to be dotted with a lot of vintage trailers, and on Friday we expect to have 83 parked all over the place. Saratoga Springs State Park may never be the same.